Random House Trade Paperbacks, 9780812980233, 384pp. Justin Kramon’s debut novel, Finny, is a sweeping, enchanting voyage, an insightful story about a young woman’s complicated path to adulthood. We meet Finny Short as an observant, defiant fourteen-year-old who can’t make sense of her family’s unusual habits: Her mother offers guidance appropriate for a forty-year-old socialite; her father quotes Nietzsche over pancakes. Finny figures she’s stuck with this lonely lot until she meets Earl Henckel, a boy who comes from an even stranger place than she does. Unhappy with Finny’s budding romance with Earl, her parents ship her off to Thorndon boarding school. But mischief follows Finny as she befriends New York heiress Judith Turngate, a girl whose charm belies a disquieting reckless streak. Finny’s relationships with Earl and Judith open her up to dizzying possibilities of love and loss and propel her into a remarkable adventure spanning twenty years and two continents. Justin Kramon has given us a wickedly funny odyssey with a moving and original love story at its core. Finny introduces us to an unforgettable heroine, a charmingly intricate world, and an uncommonly entertaining and gifted young novelist. A graduate of the Iowa Writers’ Workshop, Justin Kramon has published stories in Glimmer Train, Story Quarterly, Boulevard, Fence, TriQuarterly, and others. He has received honors from the Michener-Copernicus Society of America, Best American Short Stories, the Hawthornden International Writers’ Fellowship, and the Bogliasco Foundation. He teaches at Gotham Writers’ Workshop in New York City and at the Iowa Young Writers’ Workshop. Now twenty-nine years old, he lives in Philadelphia. 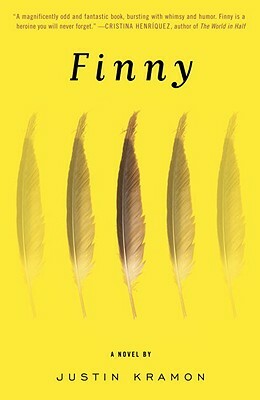 "[C]ombining the human panoply of David Copperfield with the cutting colloquial wisdom of The Catcher in the Rye...Finny is the rare authentic coming-of-age novel. The protagonist matures without losing her sparkle. Her view of people changes as she adds new facets to the prism of her consciousness. The supporting characters also grow in unlikely and often heartening ways." "Imagine Charles Dickens had been bundled into a time machine, given a stack of Judy Blume novels to read en route to the 21st century, then asked to write a coming-of-age tale set in modern America. He might well have produced something along the lines of Justin Kramon’s gently charming and slyly subversive debut novel...Adult readers will find echoes of their own youth in Finny’s story as she grows up, goes to college and finds work. The arc of her romance with Earl is movingly realistic, and the descriptions of their sexual experiences is refreshingly honest: unsentimental but full of heart...If I had a teenage daughter, I’d give her this book and hope it would help her turn out the same way." "There are sad moments in Finny...but Kramon finds humor in sadness, and the novel’s overall impact is optimistic...Kramon is a talented young author and Finny a worthy read, and a dickens of a first novel." "Justin Kramon’s moving and engrossing, Finny, is as refreshing as it is unusual: Dickensian in its span and generosity, contemporary in its exuberance and furtive humor, timeless in its assessment of family and friendship, innocence and love, this is a debut novel of exceptional achievement and considerable rewards." Featured in New York Times New Releases for July. "Justin Kramon explores the multifaceted ebb and flow of human relationships. He dispels the myth that the relationships we choose, whether with friends or lovers, are any less conflict-ridden than the familial ones into which we are born...Kramon is especially adept at moving Finny's story from the stark drama of adolescence...to her tempered, grown-up world where she makes peace with the flaws in herself and those whom she loves." "Think Holden Caulfield, Augie March and Garp rolled into one...girl." "It's [Kramon’s] delicious way with a phrase that makes this a great read…It is a super summer book; buy it as a beach book or a rainy day book, but buy it." "Finny is so many things: funny and brave, loyal and giving, but the one thing she most certainly is not is boring. In the pages of Finny, Kramon captures the difficult transition from girlhood to womanhood with remarkable tenderness and insight... Without a doubt, Finny is the perfect coming-of-age read for those who are eternally young at heart." "People are talking about Finny... both inside of and outside of Justin Kramon's debut novel." "Justin Kramon's beach-perfect debut... is full of unforgettable oddballs...the most refreshing summer novel I've read in a long time." "Kramon’s wit and impish cast of characters call to mind the work of Roald Dahl..."
"A fresh, appealing, funny, and big-hearted first novel by a fresh, appealing, funny, big-hearted, and talented young novelist. With Finny, Justin Kramon has made a winning debut." "What starts off like a funny episode of Freaks and Geeks spins into a full-blown coming-of-age adventure..."
"Justin Kramon has written a magnificently odd and fantastic book, bursting with whimsy and humor. Finny is a heroine you will never forget." "[A book] that is suffused with tenderness and the promise of good things for the author's future." "[A] story pervaded...with a flavor of Alice in Wonderland...Kramon's taste in quirky minor characters - a screaming headmistress, a sneezing undertaker - lends the story a surreal air..."
"Finny is a sprawling book about life, love, and growing up. Kramon balances tragedy and comedy as he explores the tension between expectations and reality, hope and disappointment, the people we want to be and the people we really are. Jam-packed equally with laugh-out-loud moments of humor and gently probing moments of loss, Finny is a novel in the tradition of solid storytelling, and it is a rollicking good time." "This smartly written coming of age tale can be appreciated by everyone from young adults to senior citizens. Kramon crafts a world that is instantly relatable yet fascinating in this always clever book. As Finny transitions from childhood into adulthood, her character remains genuine and mesmerizing." "It's a really good and rare thing when you read the teaser of a book and think, "This will be amazing!" and then it actually lives up to the hype in your head...That's what happened with Justin Kramon's debut novel, Finny...Kramon writes with purpose. From the succinct chapter titles...to his poetic descriptions of inconsiderable emotions and moments..."
"Calling it a dramatic novel doesn’t really do it justice, because it’s funny as well. It’s [a book] that had me laughing out loud making people around me look over to see what I was reading. And I wanted to tell them. In fact, I wanted to do more than that. I wanted to read them the scene that made me laugh." "The characters are great...and the story line is entertaining and amusing... I was satisfied as I closed Finny for the last time, and my affection for the book has grown the more I’ve thought about it. Justin Kramon is definitely an author to watch for." "I loved this novel. Loved it." "A charming coming-of-age novel with unique characters...a touching debut..."